Better Methods. Better Tools. Better Business Processes. Do you see the forms, systems, spreadsheets, email... in your process maps? what their supporting systems do. how people and technology work together! Every item in the process flow. Where most of the TIME is consumed. WHO does every step of the work. WHERE the work is done. The Graham Process Improvement Methodology is a structured approach to improvement that has helped people simplify, streamline, and develop business process flows for over half a century. This relates to lower costs, increased revenue and improved service. It is work simplification adapted to office work. 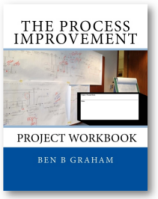 Enhance your office transformation with Graham Process Improvement methods and tools. Our methods have had close to seventy years of development and refinement, particularly in information flow, an area that had been largely ignored until recently. And they work. They are an excellent fit with Lean and Six Sigma, adding established information workflow improvement tools to the kit, particularly our detailed process mapping method. Read the promotional letter for our second Workshop and see what we were offering in 1954! "At Xerox Corporation, I was in a Lean Six Sigma Master Black Belt role. I think all of the work we did at MBNA was Lean work - continuous improvement - we just didn't call it that, or use the Japanese words for the concepts. 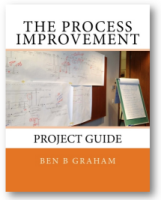 Your Graham Process Improvement Methodology was years ahead of the Lean bandwagon." "I have worked in consulting several years. During that time I have practiced the sound process improvement methods taught by the Ben Graham Corporation. In recent years, I have studied and practiced the Six Sigma methodology. While attending the Six Sigma Black Belt course, I was disappointed in the cursory emphasis given to process improvement, since process focus is the heart of improving business performance. The basic charting methods suggested in the Six Sigma course are effective when looking at a process in a macro view. However, the Graham Process Maps provide more detail needed when analyzing a process. I recently facilitated a project in the health industry that resulted in more than $200,000 in savings. We charted the process using both the basic Six Sigma method and a Graham Process Map. The team found the Graham Process Map easier to follow and much more effective in presenting the relative facts needed to recommend improvements." Graham Process Maps break down business process information flows to INDIVIDUAL documents (forms, records, applications, systems, spreadsheets, email...) whatever is used to capture, transmit or store data. They help YOU understand WHAT happens in the work flow. YOU see how every document/record contributes to the process; what makes sense and what doesn't. YOU see every place data is captured; where it is captured and where it comes from. YOU see the impact of any changes you want to make before they are implemented; in a clear, visual presentation. The maps use a notation that is intuitive to business users, and can represent any process, however complex. NO OTHER METHOD COMES CLOSE. PERIOD. Enhance your process improvement projects with Graham Process Maps? Who uses Graham Process Maps? 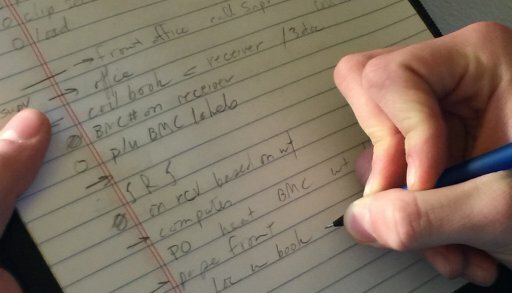 Any program (Six Sigma, Lean, TQM, Kaizen, Reengineering...) whose goal is to improve the work you do, will benefit with a solid understanding of the current information work flows: the documents that support the work, the relationship between those documents, who does the work, where the work is done and how long it takes to do the work. Only Graham Process Maps provide this information in a single picture. A Graham Process Map never fails to impress. ...and what is the difference between a process map, a process chart and a flowchart? Call it a process chart, a flowchart or a process map, it doesn't matter. While they each had a different focus at some point, today the terms are used interchangeably. The earliest description of a process chart was presented by Frank and Lillian Gilbreth in a presentation to members of the American Society of Mechanical Engineers in 1921. They said, "The Process Chart is a device for visualizing a process as a means of improving it." This is a simple, straight-forward, plain-English definition of a process map. Since their introduction about a century ago, process charts have come to have other uses. They are used to quickly understand a process (at least at a high level), they are used for training, and they are used to satisfy audit, regulatory and certification requirements for process documentation and transparency (some better than others). Rather than trying to incorporate these other uses into a definition (and surely leave something out), a simpler description might be used...a tool for visualizing a process. The tool the Gilbreths used was referred to as a Flow Process Chart or a Process Chart and the method was referred to as Process Charting or Flowcharting. In the 1940's variants of the Flow Process Chart were introduced to office work. The Multi-Column Flow Process Chart highlighted the different work areas that the process flowed through. The Horizontal Process Chart or Procedure Flow Chart took the Flow Process Chart idea and turned it on its side to show multiple flows and their relationships (This method was developed and introduced by Ben S. Graham, Sr. in 1944 and is the method we use today.) Graham Charts or detailed process charts, provide more detail than most, displaying the flows and relationships of all of the many documents that make up a business process. This type of detailed process map provides a deeper level uf process understanding compared with other methods of process mapping. In the 1960s, Flowcharting came into common usage in computer programming work. More specifically, Program Flowcharts and Data Flowcharts were employed. These computer-related flowcharts, also known as box and arrow flowcharts (where a box referred to an activity or process performed by a computer) used a different set of symbols than the "Process Charts" that were used to document work process flows. By the 1980s, the method and the name had expanded their usage beyond computer flows and into work flows where it sacrificed visibility over individual documents for a simpler single-line flow. The single-line flow led to the resurgence of the multi-column chart, now referred to as a swimlane chart. GE began Process Mapping in the late 1980s and the term 'process mapping' and the methods worked their way into common usage by the mid-nineties. Originally, Process Maps referred to a hierarchical progression of flowcharts that started out as an overview with just a few steps that could be decomposed to show more and more detail. IDEF0 charts, introduced at Wright Patterson Air Force Base in the 1980s and the Six Sigma approach that starts with a SIPOC chart from which analysts "drill down" to flowcharts with increasingly more detail represent hierarchical approaches to process mapping. Graham Process Maps add a level of clarity to process understanding that isn't available in most maps. They are an excellent addition to the Six Sigma and Lean practitioners' tool box. Today, while certain flowchart terms bring to mind specific chart variations (i.e. SIPOC chart and Swimlane diagram), the more generic terms Process Chart, Flowchart, and Process Map are interchangeable and cover a wide variation in the symbols used and the level of detail. Includes 9 checklists, 7 cost worksheets, a Project Agreement form and and 2 forms to support implementation of the new methods!